It has come to my attention that The Marvel Experience has been canceled. At this time The Marvel Experience will not be coming to Chicago and therefore there are no tickets to give away. I apologize because I know this is disappointing, but out of my control. Why just watch superheroes when you can join the experience? Become a part of THE experience. You will smash villains as Hulk, fly as Iron Man, shoot energy beams with Vision, and scale buildings with Spidey! Your journey will take you through the amazing 3D 360-degree Stereoscopic full-Dome projection theater before taking flight in the thrilling motion ride. S.H.I.E.L.D. has assembled Marvel’s Avengers to battle Red Skull and HYDRA and they need your help! Sign up as a S.H.I.E.L.D. Recruit at the world’s first ever Super Hero Recruitment Tour. Become part of this ‘all ages’ experience in the immersive, Domed attraction, as you learn about your favorite heroes and villains, all while sharpening your own super powers! Don’t wait, as this limited engagement at McCormick Place is only from July 11 through August 2. Tickets are $40-$55 per person and can be purchased online. 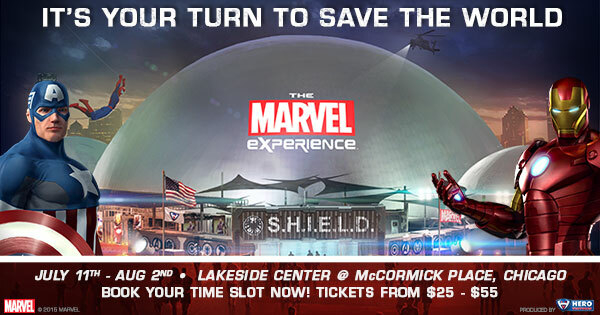 Attend the Marvel Experience as a VIP and receive perks only the top S.H.I.E.L.D. agents achieve, including limited skip the line privileges, exclusive TMX merchandise, a 15% discount in the S.H.I.E.L.D. Shop and a cinch bag to carry it all home in. Plus, you get a return trip back into the Experience! VIP Tickets are $79 Mon-Fri; $89 Sat & Sun; $99 final weekend. Purchase VIP tickets online. Enter below to win 4 tickets to The Marvel Experience at 5:00 pm on Saturday, July 25. There will be 2 winners! THIS GIVEAWAY HAS BEEN CANCELLED. Thor!!!! But i do love them all! Great giveaway! My son’s favorite is Iron Man! He would love to go to this! We love Ironman in our house!!! My boys would love this!!! My favorite is Spider-Man. Our son would love this! Great giveaway! My favorite superhero is Iron Man!